The battle looms. It is, in fact, right over a hill right in front of us. So, are Democrats girding their loins for the fight, and roaring their defiance at the opposition? Um, well, not that I've noticed. Sigh. Instead, loins un-girded and roars muted to the level of squabbling jaybirds, Democrats are once again acting like Democrats. The big fight this election season hasn't really dawned yet. And all the issues in the past will likely pale in comparison to the big fight that's just ahead of us. Senate Majority Leader Harry Reid (to his credit) set up this fight, right before the midterm election's homestretch. The big fight this year is going to be over extending the Bush tax cuts to the wealthiest two percent of American workers, and to the top three percent of American small businesses. On the other side are, respectively, ninety-eight percent of American workers, and ninety-seven percent of American small businesses. Not bad odds, even for Democrats. But the big unanswered question is whether Democrats can effectively use the issue to their advantage. Reid certainly must think so, otherwise he wouldn't have scheduled this fight for September. But, looking around, I see and hear a lot of Republicans laying the ground work for their side of the battle, and Democrats not doing the same in forceful response. This is indeed a battle worth fighting, and a battle worth winning. It cuts to the heart of the contradiction of the Tea Party's stances -- you simply cannot be for lowering the deficit and for unneeded tax cuts for millionaires and billionaires at the same time. You can choose one or the other, but not both. Because the numbers just don't add up. But we'll get to that in a minute. For Democrats unsure of how to proceed, there were two articles of note this week, one explaining how the Democrats could go on the offense on the Bush tax cut issue, and one explaining how to go on defense against the Republican ideas for the federal budget. Both are excellent suggestions, and both should be required reading up on Capitol Hill. Republicans understand the art of tax demagoguery: Put the other side on the defensive by forcing them to explain why a "tax increase" is warranted and they lose regardless. And don't stop there. Do tax jujitsu. In addition to ending the Bush tax cut for the rich, put forward another proposal for growing the economy that cuts taxes on lower-income Americans. The second article shows how Democrats should be playing defense, and should be seen as a personal plea to Nancy Pelosi to force a vote on the Republican budget plan that has rightwing pundits all excited. Paul Abrams at The Huffington Post wrote an excellent battle plan for the House to follow, while the Senate is debating the Bush tax cuts. This plan consists of one brilliant idea: bring the "Ryan budget" to a vote. Paul Ryan (R-WI) is the point person for House Republicans on the budget committee. He is considered to be a "rising star" in their ranks. He designed a budget proposal that he says would bring the nation's books into balance, without raising taxes, within 10 years. Contrary to Democrats' claims that Republicans have "no solutions", the Republicans will point to this budget proposal on the campaign trail as proof that they can do it -- this time. [Ryan's entire exercise, by the way, was to concoct a scheme so Republicans could preserve tax cuts for the wealthy -- that's their core value!]. Of course, they will not talk about the details of that proposal, such as privatizing Social Security and turning Medicare into a voucher program with vouchers that will increasingly not meet the costs of medical care for the elderly. Instead, they will just assert "we did it", fend off Democrats' attempts to point out its failings as political sniping, and win the November elections with Tea Party, traditional Republican and "Independent" support. That is, if the Democrats continue to let them get away with it by not getting them to vote for it. Then, bring the Ryan budget to a vote. If Republicans vote for the Ryan Budget, they will be voting to do what Republican paymasters like the Koch brothers have always wanted, but the electorate has never been sucked into supporting -- privatize Social Security, scale down Medicare until it is worthless. Remember Newt Gingrich's reverie, "Social Security and Medicare will be left to wither on the vine"? Democrats have shown in the past that they can run successfully against privatizing Social Security and gutting Medicare. If Republicans vote against the Ryan Budget, however, they will infuriate the Tea Party. Indeed, being infuriated is what the Tea Party is all about. They are very good at it. This is basic politics. The "in" party always schedules votes in the months before a campaign to make the "out" party look bad. Ryan's budget is much-beloved by pundits, but not so much among actual Republicans (it only has a relative handful of cosponsors). Many Republicans know that being forced to vote on it means they either vote to, in essence, kill Medicare (which they were making quite a bit of noise over last year, positioning themselves quite laughably as the defenders of Medicare)... or they have to vote against a Republican plan to balance the budget. That's a tough vote for a Republican to make, which is why they would really prefer not to have the vote in the first place -- because it is so lose-lose for many of them. But nothing is stopping Pelosi from forcing the vote. Which is exactly what she should do. If Democrats were playing hardball offense over in the Senate, and playing brilliant defense over in the House, then they could completely change the tenor of this year's election debate. Nothing is stopping them from doing so, except a lack of political backbone. We're bending the rules a little bit (as we are often wont to do around here) and stretching the Most Impressive Democrat Of The Week award to include last Thursday. Call it a long week, if you will. We're doing so in order to award this week's MIDOTW to none other than Senator Al Franken, for his speech on net neutrality and the First Amendment last Thursday in Minneapolis. It's a humdinger of a speech, so we heartily encourage anyone interested in the issue to either watch the video or read the full transcript of Franken's speech. Or, at the very least, read Timothy Karr's review of the speech which appeared in The Huffington Post (where it caught our eye, initially). Senator Franken grew up in a world where there were limits to media monopolies. Any one person or corporation could only own a limited number of media outlets -- something like [I'm doing this from memory, so correct me if I'm wrong] owning only (at any one time): seven AM stations, seven FM stations, seven television stations, and seven newspapers. Clear Channel didn't exist in the radio world, in other words. Because it wasn't allowed to. Franken understands this perhaps as no other member of Congress does (having spent a few years in a media career himself), and he has recently been forcefully speaking his mind -- both on the concept of net neutrality and also on the dangers of media monopolies and the potential harm from allowing companies like Verizon, Comcast, and Google to set the net's rules on their own. Or, as Franken put it in his speech: "...we don't just have a competition problem. We have a First Amendment problem." Franken's speech was directed at the two members of the Federal Communications Commission who were in the room. So, not only for standing up for the concept of net neutrality, but for doing so to exactly the people who need to hear it, this week's Most Impressive Democrat Of The Week is Senator Al Franken. "Today, a small Minnesota bookstore's website loads just as fast as Amazon.com. That's because right now Internet service providers don't discriminate between different kinds of content online. So if you have something to say or a product to sell, there is currently no limit to how influential or successful you can be. This is why I believe that net neutrality, and the preservation of a free and open Internet, is the First Amendment issue of our time." We couldn't have said it better ourselves. Well done, Senator Franken. Picking a winner of the Most Disappointing Democrat Of The Week this week was easy. Generally, this is not a good thing. Specifically, what was said by ironically-named Representative Bobby Bright from the state of Alabama earned him the MDDOTW award, hands down. Congressman Bright this week stepped over a clear line, in an especially egregious fashion. There's a basic rule all politicians should follow all the time. This rule is: "Don't ever -- ever -- speak of the future death of another politician." It doesn't matter what the context. Pundits can speculate idly on "Well, if politician X were hit by a bus tomorrow," and average citizens may also indulge in this sort of thing, but once you take up the mantle of being a politician, you cannot ever say anything like this ever again -- at least not in public. This applies across the board -- whether the context is a sober hypothetical situation, making a joke, or taunting an opponent in a campaign. It even applies (perhaps even more so) to other politician's families. It applies to politicians of any party, too -- it's a universal rule. What made Bright's comments so odious is that he wasn't talking about a Republican. Instead, this Blue Dog Democrat was making light of the Speaker of the House of his own party, Nancy Pelosi. Now, a Democrat trying to get re-elected in Alabama is certainly allowed a lot of slack in terms of distancing himself from Pelosi, who (I am just guessing here) may not be very popular among his constituents. But "distancing" is one thing. Speculating about her death, for a cheap laugh, is quite another. The initial report was that Bright "joked that Pelosi might lose her own election, decide not to run for the speaker's job or otherwise not be available." Intrepid WashingtonPost.com blogger Greg Sargent called up the reporter in question, who provided the actual quote: "heck, she might even get sick and die." No further commentary is necessary on Bright's disgraceful words. By unanimous consent, Bobby Bright is far and away the Most Disappointing Democrat Of The Week. Have you no shame, Congressman Bright? I ran an informal and completely unscientific poll this week (if you haven't seen it, feel free to post a comment, as I'm still tallying results), on the subject of: "Why is the Left disappointed with Obama?" Read the article to see what brought this on, and the (too long) list of answers to that question. Far too much emphasis on bipartisanship; far too little emphasis on standing up for core Democratic values and using his bully pulpit to give voice to the Democratic narrative. Being too quick to bargain away the strongest and best part of legislation. This should serve as a blueprint for both the White House and the Democrats actually out there fighting for their political lives on the campaign trail. The Democratic base is upset because nobody seems to be using a megaphone to broadcast the Democratic narrative (which Robert Reich also wrote a good article about this week, I should mention); and nobody seems to be standing up for strong legislation in the face of watered-down do-nothing incrementalism. Remember this when girding those loins, Democrats. Stand up for something, tell the people what you're standing up for, and then stand firm and defend it against those who would callously trade it away for votes that are never going to materialize. This week, we're providing some armor for the fight. Democrats need to get a jump on the battle in Congress, and start laying the narrative groundwork for the Bush tax cuts battle. Luckily, the public is on their side, as recent polls show around six out of ten Americans think raising taxes on the ultra-wealthy is a dandy idea right about now. So start to make your case! Robert Reich, in his tax cut article, makes this point crystal clear, so I'm just going to swipe his bullet point here. Democrats should start talking about the tax cuts using the following two terms: "millionaires' tax cuts," or, even better, "tax cuts for billionaires." [E]xtending the Bush tax cut to the richest Americans would give them a $36 billion bonus next year. ($31 billion of this would go to billionaire households.) And that $36 billion would be added to the budget deficit. Tax cuts for billionaires, or deficit reduction? Which brings us straight to the second point. "I'd like to ask my Republican colleague what his highest priority is: tax cuts for billionaires, or deficit reduction? Because you simply cannot have both at the same time. Just one year of Bush billionaire tax cuts would cost the Treasury $36 billion. Is it more important to send $31 billion of that to people who are already billionaires, or is it more important to do something about the deficit? Because, once again, you cannot do both at once. So which is it?" And let's not forget where that money's coming from. "So you're arguing to put almost a trillion dollars over ten years onto the 'Bank of China credit card' so that rich folks don't have to pay the same tax rates they used to pay under Bill Clinton? Really? Is it really worth loading our children with a trillion extra dollars in debt, so that the ultra-rich need never sacrifice, when America is in the midst of two wars that Republicans refused to pay for and an economic crisis the last Republican president left us in? Because I don't think it's worth borrowing all that money from China to give billionaires a break on their taxes." Don't let Republicans get away with their historical revisionism, either. "Let's see, Bush lowered taxes, and we had a stagnant economic decade. But Clinton raised taxes at the beginning of his term -- and the Republican Party freaked out with all of the same dire warnings you're hearing today. 'It'll kill jobs, it'll kill the economy,' and all the rest of it. Go back to the early 1990s, and read what they were saying then. But, as I recall, the rest of the 1990s turned out pretty good, and Clinton left with a balanced budget. So I guess raising taxes doesn't destroy the economy after all, does it?" Another piece of Republican nonsense still occasionally rears its ugly head. Democrats need to reflexively stomp on this one, because it is so laughable. "I'm sorry, but my Republican friend is talking about the Bush tax cuts as if we're going to have a vote on the entire package -- an 'either/or' vote, in other words. That's just simply false -- that's not the way Congress works. We can, quite easily, keep the president's promise not to raise income taxes on anyone making $250,000 a year, and still change the tax brackets for those above that line. That's what the committees are for, to examine things piece by piece. So I really wish the Republicans would talk some sense on this issue, instead of saying that all the Bush tax cuts have to be either extended or ended as a single package, because they don't. That's just not how it works, period." Republicans have come up with yet another nonsensical term in this debate which really needs nothing more than a loud laugh in their face whenever they attempt to use it. They've been saying something about how the Bush tax cuts are "existing tax law" and therefore doing anything is "making new tax law" as if it made some sort of difference -- even if it weren't false. Yet another gremlin for Democrats to stomp on. "I'm sorry, did you say 'existing tax law' to describe making a new tax law to extend the Bush tax cuts? That's funny. No, really, that's amusing. Existing tax law -- tax law that Republicans passed through reconciliation, I hasted to point out -- is that all the Bush tax cuts fully expire next year. That is 'existing tax law,' and it is the law which Republicans passed, and never made permanent even when they had control of the House, the Senate, and the White House. You know why they never did make the tax cuts permanent? Because they were afraid of exploding the deficit. Now they're no longer afraid of adding a trillion dollars to our deficit, apparently. But let's be clear on this -- existing tax law which Republicans passed states that the Bush tax cuts become a pumpkin next year. That is why Democrats are going to fight to make new tax law extending middle class tax cuts, but at the same time refuse to hand more billions over to billionaires who aren't exactly hurting right now." The Republican go-to argument in any tax-cuts-for-billionaires debate is nothing more than warmed-over "trickle down" from the Reagan days. It says that if we just allow rich folks not to pay so much in taxes, then rich folks will invest the money in business, which will create jobs. Except for an inconvenient truth. "You say you want tax cuts for billionaires so they'll invest and provide money to businesses to hire people. But that ignores the fact that American business is right now sitting on a huge pile of money -- in the trillions of dollars -- and they still aren't hiring. Hiring is done when demand goes up, whether politicians want to admit it or not. And the best way to spur demand is to give all workers a break on payroll taxes -- up to the first $20,000 of income payroll-tax-free. This puts the money into consumers' pockets, and gives everyone a break on their tax load. This will spur the economy much more than boosting billionaires' bottom lines. And when people start spending this money, demand goes up and businesses will start to hire again to handle the increase." Good to have you back and in form. As always, a compelling Friday treat. I'm soooo tired of it, but I'm curious what/how many things the nay-sayer twins have to inflict on the rest of us. Not really. It cuts to the heart of the contradiction of the Tea Party's stances -- you simply cannot be for lowering the deficit and for unneeded tax cuts for millionaires and billionaires at the same time. Sure ya can, if you'd like to get this economy moving again. Just slash a bunch of federal programs, starting with HCR. Let's get everyone on record, how's that? Bring it to a vote! Secretary Geithner spoke earlier this month on tax and fiscal policy at the Center for American Progress. His address will be of great interest to all those who are not familiar with the current debate about what should happen to the Bush tax cuts, scheduled to expire this year. Where is the historical and empirical evidence that would support the argument that extending the Bush tax cuts to the top two percent of the wealthiest Americans and to the top three percent of American small businesses will spur the economy? Answer: There is no such evidence. On second thought, you might want to save that for a Tuesday or Thursday column - that way I avoid a lot of HP frustration. Come to think of it, you didn't forget about him at all ... at least, not subconsciously! The title of this weeks FTP harkens back to a very important speech Biden gave just before the big election ... the 'Augean Stables' speech, as I will forever affectionately refer to it. I think you'd be hard-pressed to find many Americans who've even heard of Paul Ryan, much less his road map proposal. I think a vote would be a tad premature for legislation that proposes such huge changes. I think he's a real visionary, though. I like his ideas a whole helluva lot more than the bloated, disfunctional, Big Bro government we've got going on now. But if Ryan's ideas are the greatest thing since sliced bread (as many rightwing pundits have been saying for months), then all it needs is a little publicity. And if Nancy Pelosi gives it that publicity for free, how can that be a bad thing? If the idea is superior, then Americans will resoundingly support it. If the idea stinks, then there will be a different result. So what's to lose? Where are the courage of your convictions? Bring it to a vote! "Uh huh.. hu...huh... He said 'loins'.. uh huh huh huh." Many of the choices you gave for that poll have the COUNTRY's interests at stake..
Do you know how many Americans will choke on their drinks when they hear Democrats attempting to be "Deficit Warriors"??? I mean, seriously... Democrats fighting for lowering the deficit??? After fighting tooth and nail, fighting the AMERICAN PEOPLE to raise the deficit to unheard of heights!?? NOW they want to fight to LOWER it??? I mean, com'on.. Many Americans may have been born at night, but it wasn't LAST night.. The Clinton years were a fluke, due the dot.coms.. You really can't take ANYTHING from the Clinton years and apply it accurately to the here and now. Yes they do. And it's THEIR money.. They are holding onto it because they aren't sure how bad Obama and Geinther are going to frak up the economy..
You want business to release some of that money into the economy?? Get the Obama administration to put some sanity back into play instead of this insane spend and spend and spend some more plan..
Com'on People.. I realize it's fun to be PollyAnna, but seriously.. The ONE question that voters face this election is simple..
"Are we better off NOW than we were under Republicans?" And the undeniable fact is, the answer is NO... Not by a long shot.. This is why Democrats will lose and lose big this election.. But if Ryan's ideas are the greatest thing since sliced bread (as many rightwing pundits have been saying for months), then all it needs is a little publicity. And if Nancy Pelosi gives it that publicity for free, how can that be a bad thing? If the idea is superior, then Americans will resoundingly support it. If the idea stinks, then there will be a different result. So what's to lose? Republicans: We'd like to bring this bill to the floor. With RINO's and conservative sell-outs representing their own interests instead of the people back home, Tea Partiers have plenty of reason to be infuriated. That's the whole reason they're cleaning house. And it would seem they have a lot of Republican voters behind them, and a lot of incumbents getting their conservative acts together. Those seats belong to "we, the people," to fill as we see fit, and it's high time somebody reminded politicians of that. I think the Tea Partiers are doing a spectacular job of it. agreed about the tax cuts for billionaires. the idea of "taxes" as a monolith is one of the biggest frauds perpetrated against the american public. some taxes can improve the economy by going down while others can help by going up, depending on the type of tax, the current rate and the people involved. reagan said that if you cut taxes for the rich, they'll spend it to create jobs and grow the economy. thirty years of evidence says that when you cut taxes for the rich, they put it in their pockets and let the economy fend for itself. When all is said and done, when all the speeches and partisan bickering is behind us, the one inescapable fact remains. Things were bad under the GOP. THAT is what voters are taking into the voting booths with them..
What the HELL is Obama thinking??? How can ANYONE **NOT** catch the stench of "royalty" about the Obamas and their sense of entitlement and their "DO AS I SAY NOT AS WE DO" mentality??? Surely I am not the only one that sees this, eh?? I mean, forget partisanship and taking sides and what have you.. Surely ya'all aren't going to defend this, eh??? The political tin ears on both the Obamas never cease to amaze me. I've never seen anything even close to this for all the years I've been following politics. At this point in his term, Obama's been on vacation for 80 days. At this point in Bush's first term, he had been on vacation a whopping 220 days. That's almost a 3-to-1 ratio. Ronald Reagan spent more on "the presidency" than anyone since, is my guess. From the White House china Nancy demanded, to the new 747 Air Force One (and Two -- pricey items, indeed), please don't give me all the "I'm shocked!" and "never before in history" stuff now. Didn't Obama cancel a new helicopter Marine Corps One because it would have cost too much? Like I said, Puh-leeze. If the man needs new curtains after a year and a half in office, I don't begrudge him those curtains. To temper this, I raise a subject I raised last year (if memory serves). To whit: Tea Party rally attendence. Last year, outlandish claims led me to address the subject in either a column or here in the comments. People were claiming "1-2 million" people showed up, which was absolute horsefeathers. I estimated the crowd at around 75,000, which I thought was fair. Beck's rally, on the other hand, was a lot bigger. I heard him claim "300,000 low end" and "650,000" high end, which I truly think is optimistic. Now, the other end of the Mall, which houses the Lincoln Memorial and the Reflecting Pool (from the LM to the Washington Monument), is a lot shorter than The Mall section from the WM to the Capitol -- by about half. But it is much harder to tell exactly how many people are there (than from shots of The Mall section), because of two reasons -- the RP divides the whole area, and occupies the center ground; and there are two lines of trees (on each side) which make overhead or even aerial photography tough (to get a clear shot of the crowd). The third, more minor, issue is "crowd pack," or how closely everyone is sitting/standing. But, having said all of that, from the photos I've seen so far (and I admit I haven't seen a definitive overhead shot yet), it looks to me like that crowd is at least 100K, and possibly as large as 250K. That's a lot of people. That's a medium-large demonstration, by any measure. So, to be scrupulously fair, I have to say, the Beck rally had a pretty good turnout. 100-250K is nothing to sneeze at, even in the eternally-hard-to-impress DC. hmm, might have had something to do with the higher taxes they would have had to pay had they kept it there. and to be fair, some of the modest tax increases that led to a stronger economy in the 90's were passed by bush senior, which in my mind was a brave and principled stand against the tax-alarmist wing of his own party. At this point in his term, Obama's been on vacation for 80 days. But that's not my point..
Obama has said time and time again that Americans must tighten their belts and forgo certain pleasures, make sacrifices... Yet, they take lavish vacations, jet setting to Spain and have his office with a, no doubt, very expensive make-over. From the White House china Nancy demanded, to the new 747 Air Force One (and Two -- pricey items, indeed), please don't give me all the "I'm shocked!" and "never before in history" stuff now. Seriously... With Obama's constant words about tightening one's belt and making sacrifices etc etc etc... It just boggles the mind that the Obamas would be so totally and utterly ignorant as to how Americans are viewing this..
OK.. Good.. So we agree that businesses are allowed to make decisions about their money based on financial interests and not what's good for the country. So, in the here and now, since it is better for their bottom line to hold onto the money until Obama et al are finished wrecking the economy and things REALLY start to improve, it's logical for those businesses to hold onto their money. About that, it's really funny.. The hysterical Left was up in arms about how it was "sacrilegious" that Beck would do his schtick on the same day at the same place where MLK did his famous, "I HAVE A DREAM" speech.. These same hystericals, though, don't see ANY problem with having a Cordoba Mosque a couple blocks from the site of the worst terrorist attack on US soil committed by Islamic Terrorists. At this point in his term, Obama's been on vacation for 80 days. At this point in Bush's first term, he had been on vacation a whopping 220 days. I love how Bush's WORK DAYS at his home AND Camp David, with cabinet members and military figures, are counted as "vacation days" by the Left. But, having said all of that, from the photos I've seen so far (and I admit I haven't seen a definitive overhead shot yet), it looks to me like that crowd is at least 100K, and possibly as large as 250K. I think we're talking more like 500,000. Minimum. Irregardless of all that, my point is that Obama should be seen tighten HIS belt and his FAMILIES' belt and making sacrifices, like he is asking the rest of the country to do. It's the extravagance of the Obama Lifestyle that is COMPLETELY at odds with the message that Obama wants to send..
Why is it that the rallies from the Left are all about violence and the rallies from the Right come across as a neighborhood barbecue??? Because the Left is dedicated to projecting their own downfalls onto Righties? What do I win? Actually, under Reagan, the economy was just as bad, if not worse. CBS paid someone to photograph and count the crowd. They came up with 87,000. That's a far cry from a half a million. I don't remember it as bad..
CBS paid someone to photograph and count the crowd. LOL. 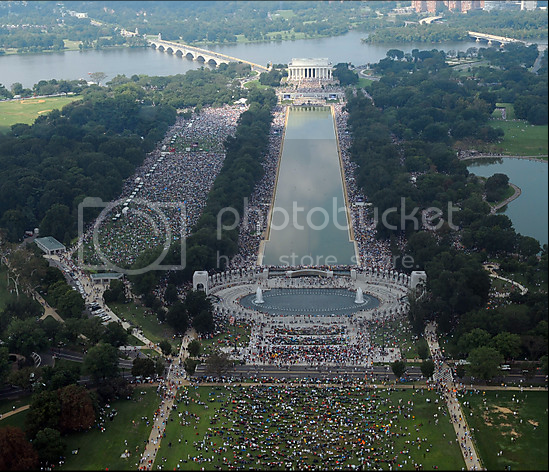 Well, I guess 87,000 turned out for the Million Man March and Martin Luther King's speech, in that case. Because Beck's event is just as stuffed on both sides of the mall, and beyond, as either of those two event were. I don't know how to put this politely, so I'll just say it. Your memory needs refreshing. Actually, that was fairly polite, now that I think about it. Look into the period 1980-1982 for some economic data. Then compare to 2009-now. "The new china, White House renovations, expensive clothing, and her attendance at the wedding of Charles and Diana, Prince and Princess of Wales, gave her an aura of being "out of touch" with the American people during an economic recession. This and her taste for splendor inspired the derogatory nickname "Queen Nancy"." I'm not saying you don't have a valid point about appearances, mind you. But I am saying you're wrong that it's never happened before. Because it most certainly has. There's nothing new under the sun in politics, in other words. When comparing photos, remember there are two parts to the Mall. The Mall itself, between the Capitol and the Wash. Mon., and then the Reflecting Pool part. I don't think 500,000 people could even fit in the RP part -- there just isn't enough room. Check a map of DC to see what I'm talking about. Anyway, I stand by my off-the-cuff figuring. Around 100,000, possibly as great as 250K, but probably closer to 100K. Last time around, I guessed 75K, and the organizers were claiming 2 million, which is just laughable. This is why the Park Police gave up crowd estimating, because nobody's ever happy (they gave up after they pointed out that there weren't a million men at the Million Man march, which I actually agree with -- maybe half a million, maybe 750K, but not a million). Rasmussen's been showing this size lead for awhile now. I'm surprised it's showing up on Gallups RV's so soon. Took a look at your photo -- that's a very nice shot of the crowd, just wanted to say that. Someone stood in a very long line to get to the top of the Washington Monument to take that photo. After having seen it, I still stand by my estimate, though. How come there are no aerial shots of Sharpton's rally? After having seen it, I still stand by my estimate, though. I think the more embarrassing question for Sharpton and the Left in general is, "Which rally would Dr Martin Luther King be more inclined to attend?" I think with the patriotism and inclusion that Becks rally had in abundance and the vehemence and divisive rhetoric that was the staple at Sharpton's rally, it's clear that MLK would have been more likely to attend Beck's rally.. I seriously doubt MLK would have shown up for Beck's rally, as Beck said on Fox on Sunday that he "didn't agree" with the entire economic aspect of MLK's agenda, which was an enormous part of what he was trying to do. I mean, do you listen to yourself sometimes? What estimates are given for the IHADream speech? Haven't heard any. Interesting thing about that was (if memory serves) the audience for MLK was actually in chairs. Yep, they set up thousands of folding chairs for folks. Don't know if everyone got a seat, though, I'd have to see some pictures, especially of the edges. I don't know what having chairs would do to crowd density, might raise it or might lower it. But check the photo you posted, and look for the amount of green in the crowd areas. If you can see more green, the crowd's lighter. If you can barely see any green, the crowd's tight. Totally green areas are usually those where either security barricades are set up, or (more likely) have no line-of-sight to the stage, or access to loudspeakers or video screens (picture yourself on the ground, walking around). Anyway, just curious if you've got a photo of the MLK rally and any crowd estimates. Just wanted to say, I wasn't trying to put Beck down in any way, I actually said it was a big crowd, by DC standards. Not huge, but medium-big. And that it was an impressive turnout. Anybody that can get 100K+ folks out is doing pretty good in DC, which sees rallies and marches and events with some mighty tiny crowds, at times. One thing to keep in mind is Beck himself filed his permit for 300K, so anything bigger than that should have totally spilled out into adjoining areas. But, like I said, it was a decent turnout, that's for sure. I think there's going to be another one of these on 9/12, don't know if Beck's behind it or the Tea Parties. That one will be all political (this one couldn't be, due to tax laws, as it was raising money for a charity). So we'll see how many turn up for that one. I remember the chairs. Pics are online, Chris. I'll go dig some up. You'll see that Beck's crowd — which was shoulder-to-shoulder — covered the same area as MLK's event. Just wanted to say, I wasn't trying to put Beck down in any way, I actually said it was a big crowd, by DC standards. Not huge, but medium-big. I know you weren't looking to put him down. But I'm hard-pressed to think of a bigger turnout for any D.C. event. Maybe a Vietnam war rally, at some point. But as aerial-view attendance goes, that was one of the biggest turnouts my eyeballs have seen. A sea of people, shoulder-to-shoulder, on both sides of the pool and extending that far back beyond it? That's multi-hundreds of thousands.